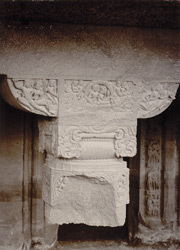 Photograph of the carved capital of a broken column from Cave 24 at Ajanta, taken by Deen Dayal in the 1890s. The magnificent cave temples are situated in a horse-shoe valley of the Waghora river in West India and consist of prayer halls (chaityas) and monasteries (viharas) built for the Buddhist community who lived there. The caves were in use for about eight centuries and can be divided into two groups according to the early Hinayana and later Mahayana phases of Buddhist art. The first group was excavated between the 2nd - 1st century BC. After a period of more than six centuries the excavations restarted around the 5th century AD in the Vakataka period. In the 'Report on the Buddhist Cave Temples and their Inscriptions' of 1883 James Burgess wrote, "Cave XXIV, after No. IV, is the next largest hall in the series, ...and has twenty columns supporting the roof, but inside only the front aisle has been advanced towards completion...The verandah, however, has been completed in a manner that shows it was intended to be one of the most beautiful and highly-finished monasteries of the group...Unfortunately...all the pillars are destroyed except one, but the capitals which are still attached to the roof are carved with very considerable grace and beauty...The sculptural subjects are to be found repeated again and again on other capitals, but not with equal life and finish, and in other caves the flying Gandharvas in the corners of the central compartment are awanting."